We’ve spoke many times about the wide range of online jobs for stay at home moms that the internet has created for us. One of these new opportunities is a bizarre website which offers an eclectic variety of services, all for $5 each. Fiverr is an online freelance marketplace which lets users buy and sell services for $5 a piece. The website takes a 20% cut, leaving the seller with $4 on the average $5 sale. Fiverr isn’t for everybody. In fact, if you can’t come up with a creative ‘gig’ that takes 20 minutes or less, Fiverr may be more work than it’s worth. Think of it this way – what is the minimum wage you would be willing to work for on Fiverr? You’re earning $4 per purchased gig; multiply that by how many gigs you can possibly complete in an hour. There’s your hourly Fiverr wage. The key to a successful Fiverr gig is coming up with something many people are interested in buying, and preferably buying more than once. Aim for attracting return customers. 1. Voice overs. There are likely businesses who could use the voice of a stay at home mom to sell their product. Female voices generally are more popular on Fiverr, so we have that going for us. You will want to have a decent microphone to make your recordings. Your default laptop microphone probably isn’t high quality enough for someone to shell over $5 for. 2. Proof reading. More accessible than voice over work for those of us who don’t have decent microphones laying around. If you have middle school aged children, or older, you’ve probably done your fair share of proof reading. Remember that you’re only getting paid $4 per gig so be wary of taking on monster documents. 3. Video testimonials. One of the more popular categories on Fiverr, video testimonials provide an opportunity for moms to sell short clips of themselves vouching for a product or service. Like voice overs, testimonials are a female dominated category. 4. Sign modeling. Get paid $4 to take a picture of yourself holding a sign. This category tends to be filled with younger girls wearing the type of clothes that would earn a call home from your child’s school. Not everybody wants that kind of person representing their brand, though. It’s worth a try. 5. Something crazy… Fiverr is pretty diverse in the kind of gigs you can find being offered for $5. Did you ever think you could pay someone $5 to paint your name on their belly and run around a jungle? How about paying $5 to have a complete stranger post loving messages on your Facebook wall with the intentions of making your special other jealous? All possible on Fiverr. 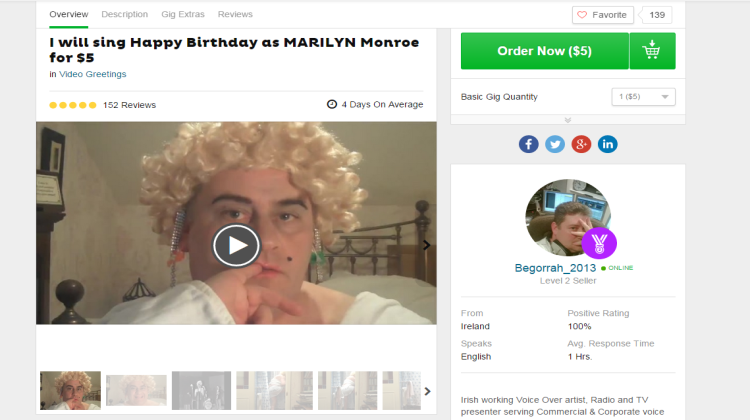 Fiverr is a crazy place where the most creative ideas are usually rewarded. Use your imagination!